August 14, 1993 was a wonderful day. I married my husband and left for a honeymoon sporting this beautiful ensemble. My man was so kind to bless me with such beauty. However, early in our marriage, I found I didn’t like wearing a diamond ring. 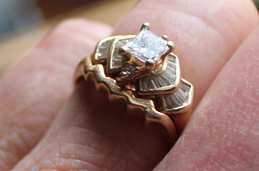 The beautiful stones and prongs were snagging on clothing and I was bumping the ring into things like the side of my my washing machine in my continual laundry duties. Whether kneading dough, mixing meatloaf, planting flowers, doing push-ups or playing outside with my children in the dirt…the diamond was getting battered and and dirty. Call me a working girl or a clumsy girl, but the diamond wasn’t working for me. In addition, I didn’t like its sparkle. I am not flashy by nature and I didn’t feel like the ring matched who I am on a regular day. I spotted a wedding band one day that I thought was gorgeous. With glee, we purchased a new band for me. For two decades now, the band has been for regular life and the diamond has been reserved for dressing fancy. 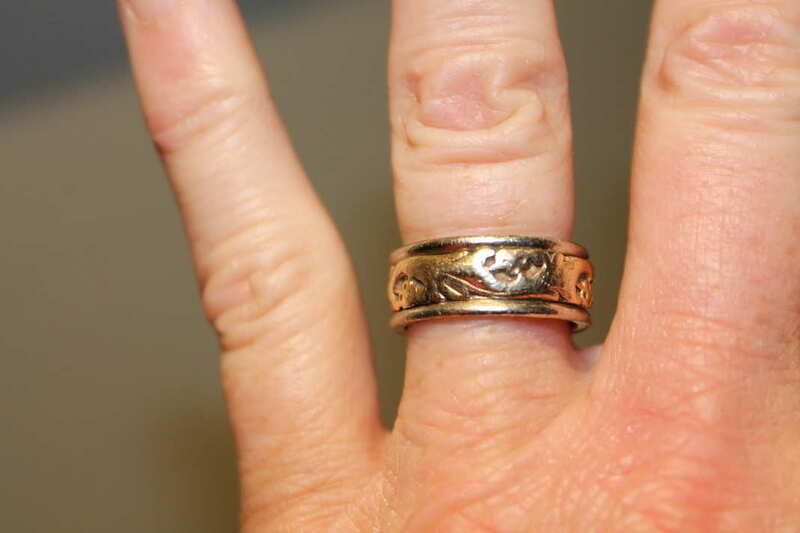 I never once…never once…tired of my wedding band. It reflects me. One month ago I noticed a crack in it during a meeting at work, then forgot about it. Two weeks ago I discovered an entire piece missing. I had no idea the gold inset was not adhered to the silver base all the way around. It had never before spun on its track. After visiting the jewelry store from where my ring was purchased, I learned what I had suspected. The scrolled design can’t duplicated and I don’t have the missing section for any sort of patchwork repair. As for purchasing the same ring again, what was once $400 is now nearly seven times that. Not an option. If only I had paid more attention when I saw the crack the first time…. 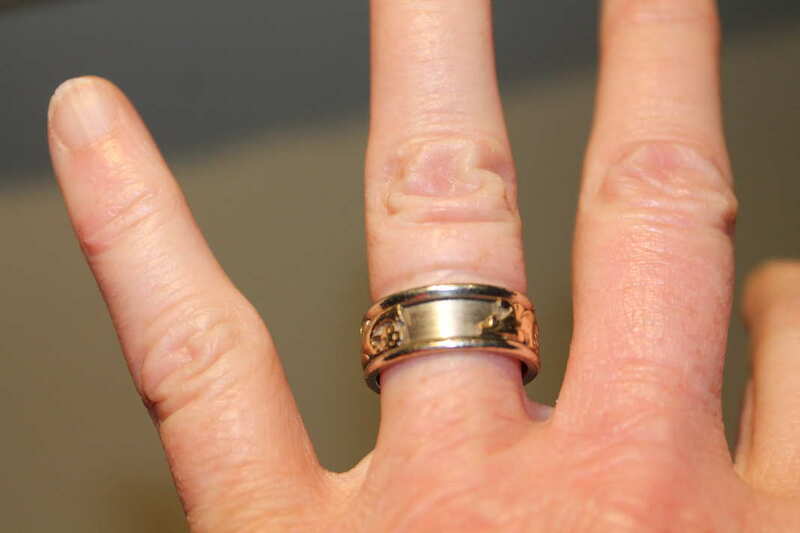 Because of my ring damage, I have been thinking about tending to “cracks” in any part of life. Every crack grows when left unattended. The little rift between you and a neighbor, left unattended, has time to fester. The whispers of distance between you and your husband, left unattended, have time to grow. The small offense between you and a child, left unattended, can lodge somewhere in his or her psyche and last for weeks on end. The credit card bill keeps creeping up just a bit until the minimum payment becomes too much to handle. The check engine light is on, but since the engine sounds okay, is left unattended. Until the day the car won’t start. Even the breakfast dishes rinse off easily directly after a meal, but every mom knows what I mean by oatmeal cement found in late afternoon. 1. Catch cracks early while repair is still possible. One reason I think we don’t address tiny cracks is because they are indeed…tiny! Those answers only work for today. Tomorrow things become worse. In a driveway, a small crack turns into a larger one because rain water and dew settles within, increasing expansion and erosion. As cars continue to drive over it, the crack wears down faster because the crack has weakened the driveway in that spot. In a relationship, a small offense not handled well turns into a larger problem. Even one thought can find a place to reside. Left unattended, that thoughts invites other thoughts to take up residency with it. Thoughts like company, have you ever noticed that? Let’s not let things pile up. When we hurt someone’s feelings, let’s run to the offended to make amends. If we discover a problem in our life, let’s deal with it now before it gets worse. Problem is, I am all too often in a rush to get to the next thing, like the day I saw the crack in my wedding band. Oh, may I slow down and tend to things in a timely manner. Someone has pushed the fast-forward button on our days. As the microwave heats our morning Danish, we pay bills online, listen for the chime on the dryer, all the while eavesdropping on Dr. Dobson on Christian radio. Little wonder we feel stressed out. Galatians 5:25 says, “Let us keep in step with the Spirit.” Often the Spirit takes very slow steps. Push the pause button, and find a way you can slow down today. Enjoy God’s glory in every small thing. She was talking about doing one thing at a time, but it applies here too with regard to detecting and repairing cracks early. What a paradox: If we slow down to to each thing well, less things go wrong and life is easier and more productive. 2. Prevent cracks in the first place. If I hurt my husband’s feelings and return to him to ask his forgiveness, he forgives me. Always does. But that offense still becomes part of our relationship and will always remain part of our history. On one of our anniversaries, I gave my husband a picture of us settled into a frame of weathered barn wood. The frame was beautiful and sturdy, but also well-worn and weathered…just like us, as I put in a note. Every part of our relationship has left either beautified or damaged our frame…every word spoken, every experience. Sadly, some of the dings were caused by me. The offenses are forgiven by God and my man, but they still marred our frame in the form of a scratch or gouge. I can sand the area and apply polish, but a scar remains as a reminder. What would our frame look like if I had prevented damage in the first place? Or if I had repaired every crack while it was still small? Somehow, it all matters. Oh, if I can just slow down and live each moment well. Taking care of matters when they are small is so much easier than taking care of matters once they have grown. What examples do you have of what starts out as a small problem but can grow larger if left unattended? © 2015 by Oaks Ministries. All rights reserved.